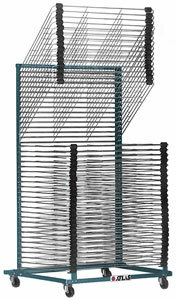 This rack is an all-steel rack with a heavy-duty angle steel base, and an exclusive tray-lock system for supporting trays in the up position. Each tray has two rubber spacers. 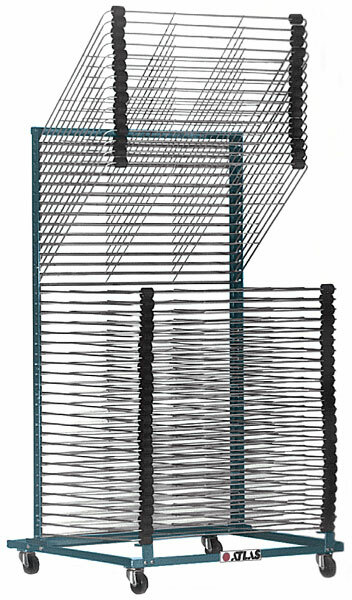 This sturdy, maintenance-free rack includes 40 trays with 1" spacing between them. It ships unassembled. Double-Sided Easy Ship Drying Rack — With all the features of the original Easy Ship Drying Rack, this rack provides double the capacity. It measures 54" (137 cm) deep overall, and provides a total of 80 trays. Trays are identical with those of the Easy Ship Drying Rack.